This was just before an assault on another guesthouse. In the wake of this massacre – 18 people were killed – most UN staff were evacuated; even low-life independent consultants like me got two weeks at home: an unexpected little bonus on the back of the misfortune of others. 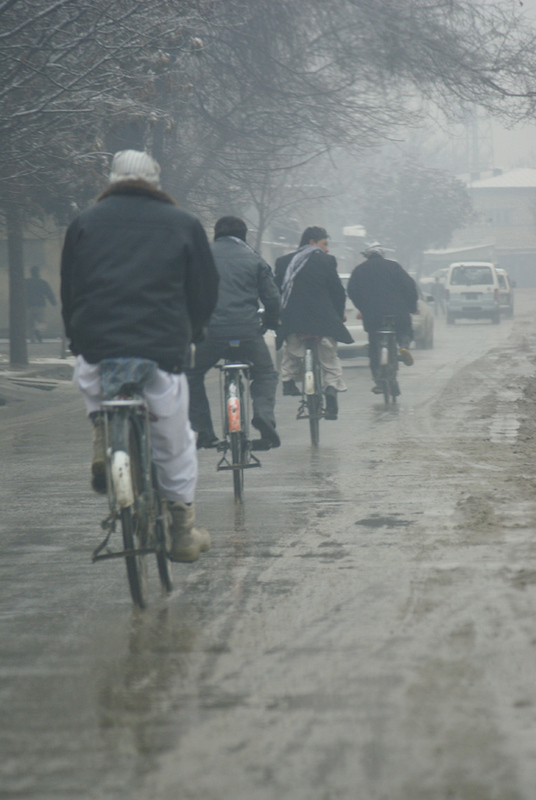 I had hardly been gone and I was back again to a double whammy of impenetrable Kabul traffic and increasingly wet and frosty winter weather – and to a fortified guesthouse that felt decidedly less secure than before. Continuing to stay in one would be foolhardy. Ai tog … he was a person of colour, you see. From the outside the house was nondescript, indistinguishable from the others in the block. The property had 7m-high walls with barbed wire and hidden security cameras on top, and an armed guard on the inside. Two huge metal-clad doors, reinforced with a steel drop-bar, blocked the gate, and when one entered through the pedestrian entrance, one found oneself in a locked steel cage. It was a bit like Johannesburg on steriods. The chowkidar, or butler, was a gentle old man who had worked for the French embassy before the Soviet invasion. He refused to respond to my broken Dari, as he was very proud of his own broken French, the language in which he proceeded to give account of his adventures: how we was flown to France for medical treatment after a serious car accident involving a vehicle from the Russian Embassy. When he was not cleaning the house or stoking the wood burners, he sat in his little room at the back of the property quietly reading from a large, old-fashioned edition of the Qur’an. There was a familiar, quasi-colonial normalcy about the dispensation behind these high walls, which contrasted starkly with the chaotic conditions in the streets outside. And in the mornings, as one waited in the steel gate at the entrance for the taxi to arrive, an armed guard at one’s side, one felt a bit like an expendable extra in Fight Club waiting for his turn. One Thursday afternoon I arrived back from work only to remember that there was going to be a party, a real expat party with people from all corners of the world. Among them was a wandering young woman from Cape Town, who had been working in the Far East. She was actually brought up English, she explained, but still spoke a bit of Afrikaans. South African red wine flowed and loosened tongues. My group sat Afghan-style on the carpet in front of the wood burner, pillows abounding as if on the set of Sherezade. “How long have you been here?” an older Brit asked me. In this setting the words “have you heard…” seemed to be vested with deeper meaning. 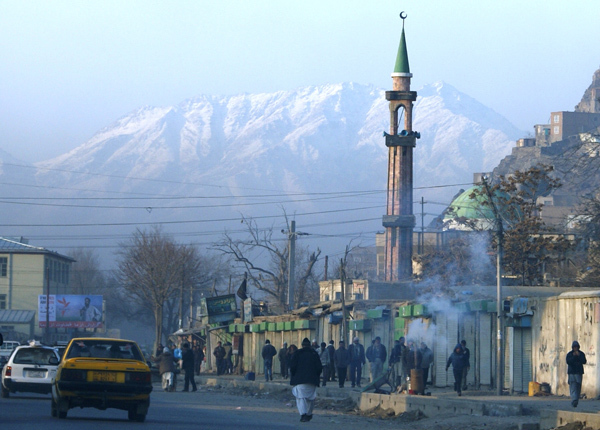 Everybody knew instantly that the story dealt with yet another of those implacable Afghanistan-style dilemmas: the woman needed permission to leave the house, yet she also needed to get help for the child. Would the child die because she couldn’t go out? Or would she go out and be punished? It was a situation with Shakespearean potential, and even the Brit fell silent. “So what’s the catch?” the Brit asked. “Terrible,” an American girl said, and there was momentary silence around the stove. “More drinks anybody?” the Brit asked and got up to fetch another bottle of wine. “How old was she?” the Canadian woman asked. “Aahw!” the woman jammered, which allowed the Brit to deliver the punchline. Much later I found out that the story was only partly true. Marjan survived the attack, but was seriously injured, losing his hearing and an eye. His mouth was also badly damaged that he could no longer smell or taste, and eventually lost all his teeth. In time he became partially paralysed and stopped moving about. 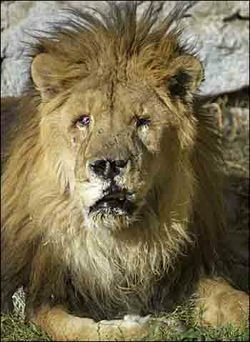 And yet, when the Americans invaded, Marjan the ‘one-eyed lion of Kabul’ was still there, one of the few surviving animals in the zoo. He was famous throughout Afghanistan by now. The people looked after him, because they felt that the old lion had suffered, just like them, and respected his bravery. When he died of old age and weakness ten years ago, the people even gave the old African a proper funeral and they still place flowers on his grave. Early one morning the sound of a terrific explosion rolled over the city. Then there was silence. “Nou ja …” I thought, rolled onto my other side, and slept on. Probably insensitive, yes, but what can one do? Several newspaper articles were written about Marjan after the US invasion. This is an excellent ‘local knowledge’ article. 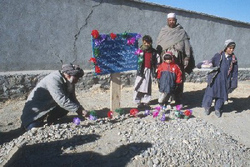 The pics of Marjan and his grave have been taken from this site.